From apricot pie to green chili hominy, The Big Country Cookbook has histories and recipes that span over one hundred years and cover over a dozen counties. Driving into the Big Country, clusters of cactus pads line the road. Mistletoe hangs from the branches of mesquite trees whose leaves provide little shade. There are farmers raising cattle for beef, ranchers maintaining the whitetail deer population for hunters, and fishermen pulling bass and catfish out of the area lakes. Like many parts of Texas, agriculture, good food, and football are community builders. 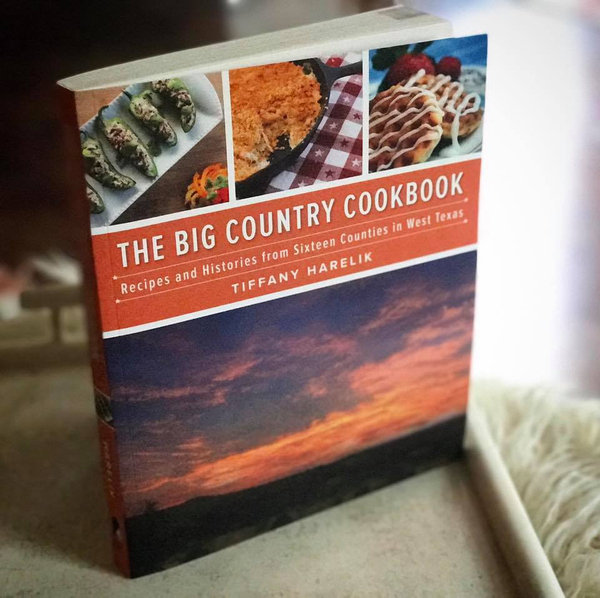 In this cookbook, culinary-travel author Tiffany Harelik takes you on a journey through sixteen counties in the Big Country and shares recipes and interviews from iconic restaurants such as Perini's, Owl Drugstore, and the Beehive; local football legends including Hugh Sandifer; and historic families like the Kirkhams and Bonners. Learn how to make cinnamon waffles, poppy seed sausage rolls, an acorn squash mash, quail, enchiladas, and more in this entertaining, one-of-a-kind, travel-oriented cookbook. We invite you to check out the book's facebook page for updates.